As a media professional, there are some saints who become part of your work. Working here at Salt and Light one those saints is Clare of Assisi, the patron saint of television whose feast the Catholic Church celebrates today. Clare was contemporary of St. Francis of Assisi. She was 18 she first heard Francis preaching. That preaching was the beginning of a transformation for her. He told her she was a chosen soul. Shortly after on Palm Sunday when people went to find something to use as palm branches, she stayed behind and used the opportunity to run away to follow Francis. Because she was the only female follower of Francis at that time, Clare was put with the Benedictine nuns near Bastia. She was almost pulled out by her father who wanted her to marry. Because her sister Agnes decided to join her, they moved together to the church of San Damiano, which Francis himself had rebuilt. Other women joined them there, and the group at San Damiano became known for its radically austere lifestyle. The women became known as the "Poor Clares". But why Clare is the patroness of television? One Christmas Eve, Clare was so sick that she could not get out of bed even to go to Mass. While the other sisters were on their way to mass, she stayed in bed praying so she could take part in the mass with her prayer. Just then, the Lord granted her a miraculous vision, and she was able to see the Mass, even though she was far away from where it was happening, as if it were taking place right in her own bedroom. In 1958, when Pope Pius XII was trying to find a saint to name as patron for the marvelous new invention called Television, he recalled this incident in the life of St. Clare. Since “television” is Greek for “vision from afar”, Clare was chosen as its patroness. Clare of Assisi, example of dedication to Christ but also the one who protects all of us who want to give to our viewers the message of the same Christ she loved so much. 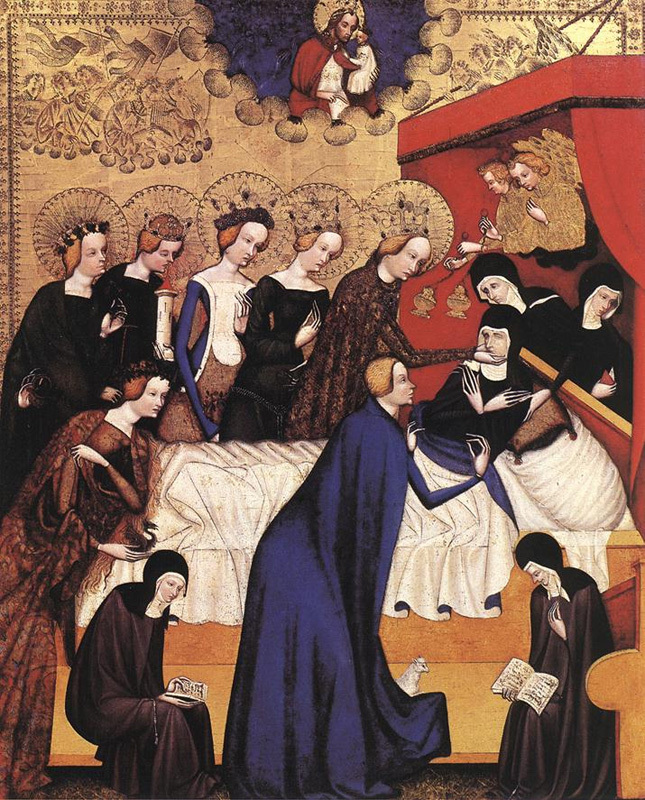 Photo: St. Clare sick in bed, telling the sisters of her vision of the Mass.